I’m showing you How To Make Breakfast Sausage so your mornings can be a breeze with a little breakfast meal prep. 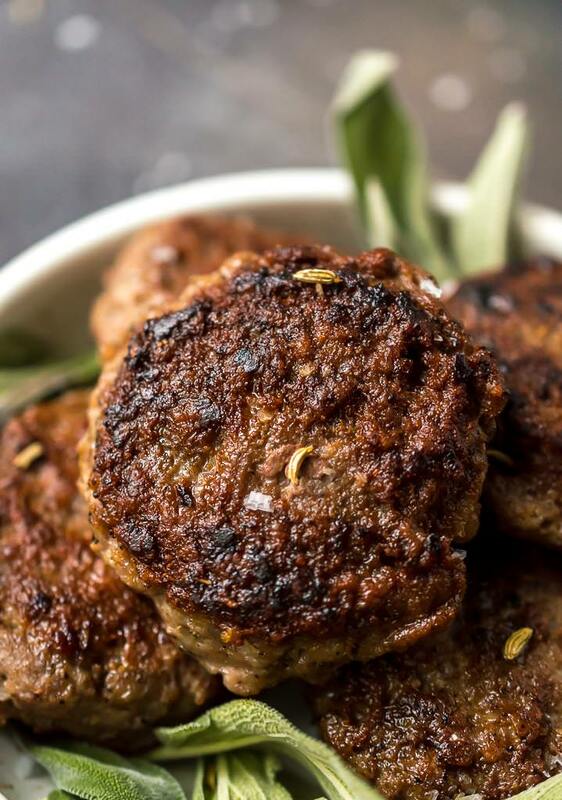 This Breakfast Sausage Recipe is a quick and easy way to start the day with some protein. No weird hidden ingredients. Just fresh simple Homemade Breakfast Sausages that can be eaten throughout the week or frozen for later. 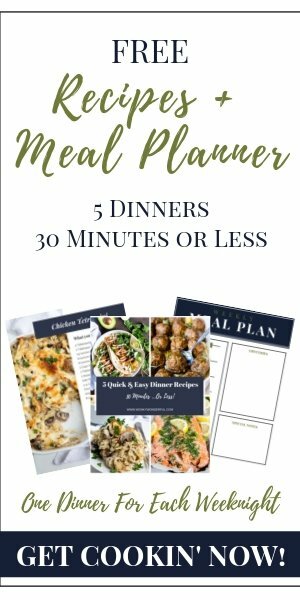 This recipe is Paleo compliant, Whole30, Dairy Free, Gluten Free and Grain Free! Breakfast . . . the bane of my existence 😆 Okay, so maybe I’m being a tad dramatic. But seriously, breakfast is the hardest meal for me. It takes me a minimum of 2 hours to be fully functional in the morning! That is why my daughter and I survive the morning thanks to Overnight Oatmeal, Breakfast Muffins, Fresh Fruit Salad, this Breakfast Sausage Recipe and if I’m feeling really motivated (hardly ever) I may make a good Breakfast Hash. I am always in need of quick low effort breakfast ideas or meals that can be prepped and ready to go in the morning. 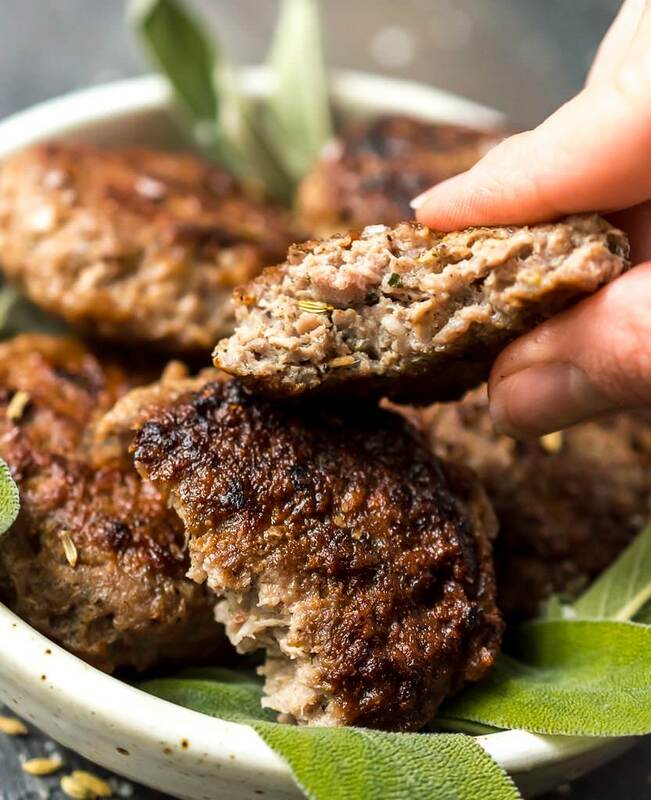 This Breakfast Sausage Recipe falls under the meal prep category. With a little effort on the weekend we can have tasty sausage patties in the morning for our weekday breakfasts! 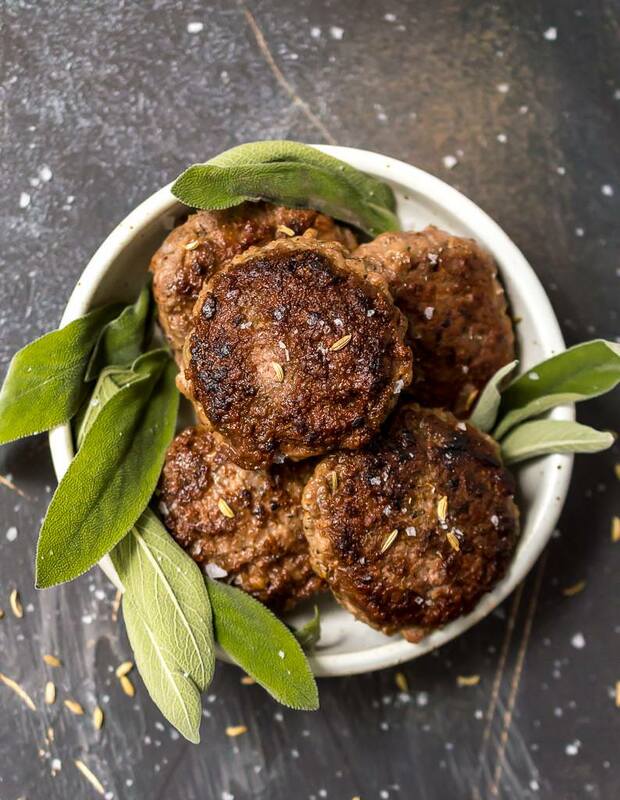 This sausage patty recipe is as easy as mixing up the ingredients, shaping the patties and frying them up. That’s It! The seasoning on these is very traditional. These sausages have the flavor of a classic breakfast sausage that you would buy at the store, without any hidden ingredients or preservatives. What is the best way to cook breakfast sausage? I pan fry my breakfast sausage over medium/high heat. This method takes just a few minutes. 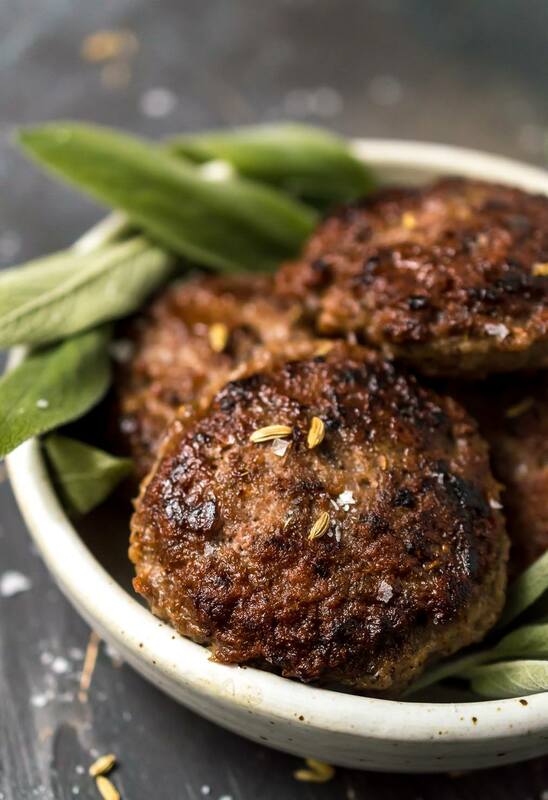 You can bake sausage patties at 350ºF until cooked through (time varies depending on thickness). This method will not get you that great crisp, browned layer. Can you freeze breakfast sausage? Yes! You can cook the sausage then freeze it. Or freeze it raw and cook it after it is thawed. I prefer to freeze it raw to prevent over cooking. 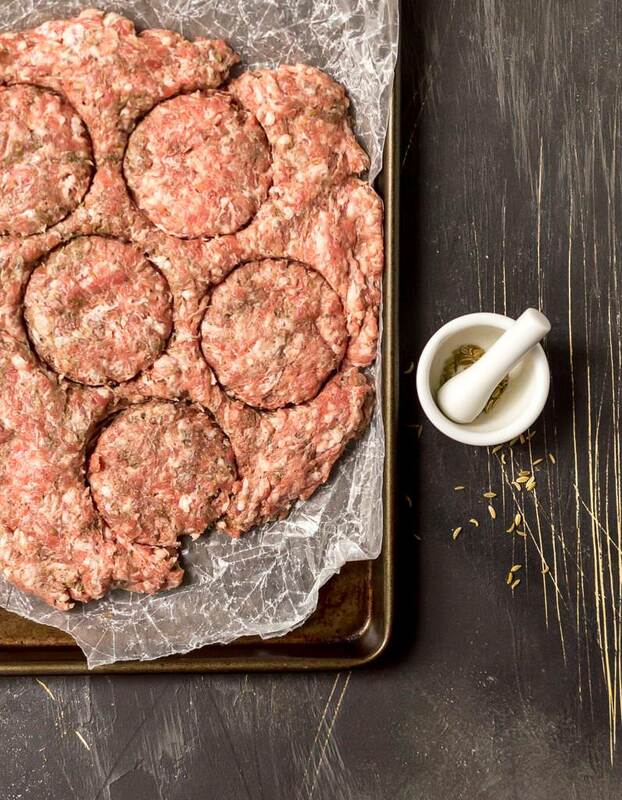 Just be sure to separate patties with wax paper when freezing or they will stick together in one giant sausage patty! What gives breakfast sausage its flavor? This breakfast sausage recipe is fairly traditional. It is flavored with sage and fennel seeds. If you like a little heat, add some cayenne or red pepper flakes. 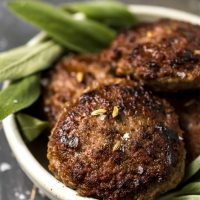 How do you make breakfast sausage patties? Simple. Just mix the ingredients. Press mixture into a rimmed baking sheet lined with wax paper. Cut into round patties, then cook. Or you can form the patties by hand but I find it difficult to produce a uniform shape and thickness with this method. It is easier to shape the patties with a Round Cutter . A Rimmed Baking Sheet and Good Fry Pan are good to have. To crush the fennel seeds, I use a Mini Mortar and Pestle . Try not to over-mix the sausage ingredients. We don’t want super tough sausage patties. If you do not have a round cookie cutter, just use a cup to shape the patties. I'm showing you How To Make Breakfast Sausage so your mornings can be a breeze with a little breakfast meal prep. This Breakfast Sausage Recipe is a quick and easy way to start the day with some protein. No weird hidden ingredients. Just fresh simple Homemade Breakfast Sausages that can be eaten throughout the week or frozen for later. This recipe is Paleo compliant, Whole30, Dairy Free, Gluten Free and Grain Free! Mix all ingredients until just combined. Press flat onto a rimmed baking sheet lined with wax paper. Press to approximately 1/2 inch thick. Use 3" round cutter to cut round patties. Transfer patties to another rimmed baking sheet lined with wax paper. Refrigerate 15 minutes to firm up. In pan over medium/high heat, fry patties for 2-3 minutes each side. To Freeze Cooked Patties: Cook patties, transfer to rimmed baking sheet then freeze. Once frozen transfer to an airtight container. Thaw before reheating. To Freeze Raw Patties: Freeze raw patties separated each by a square of wax paper. Thaw before cooking for best results. That sausage sounds delicious! Love the idea of making it yourself so you can control the ingredients. Thanks for the shout-out for my low-carb egg muffins too. My pleasure, they look tasty!